Cale Douglas Makar, professionally known as Cale Makar is a Canadian professional ice hockey defenceman. He currently plays for the Colorado Avalanche of the National Hockey League (NHL). The Avalanche selected him with the fourth overall pick in the first round in the 2017 NHL Entry Draft. He scored his first career NHL goal in his first shot in his debut NHL game in April 2019. What is Cale Makar Famous For? - The first defenseman to score a playoff goal in his NHL debut. - The highest drafted player to come straight from the AJHL. - The first Minutemen honored as Hockey East Player of the Year. 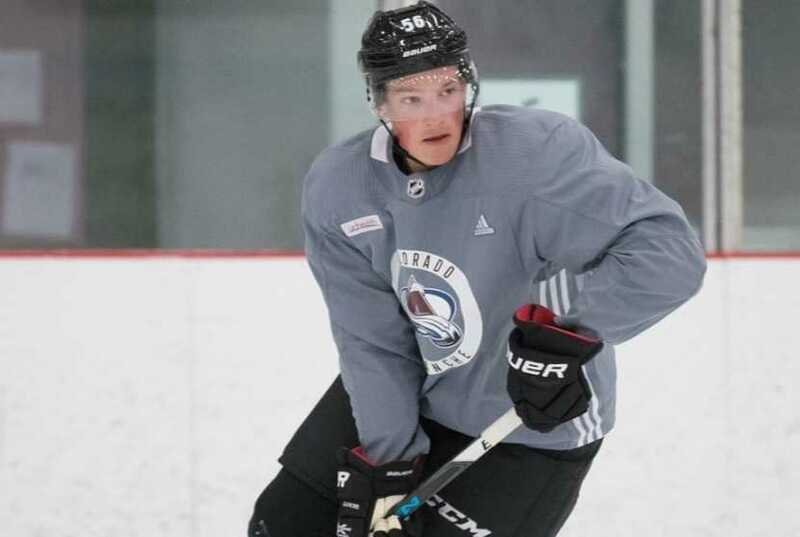 Cale Makar, a defenceman for the Colorado Avalanche has a good start in his NHL career. The 20-years old scored his first NHL career goal in his debut game just a day after he signed a three-year entry-level contract. He scored his first career NHL goal with the first shot in the league in his debut game during Game 3 of the first round of the 2019 Stanley Cup Playoffs against the Calgary Flames. With his goal, he became the first defenseman to score a playoff goal in his NHL debut. He was the highest drafted player to come straight from the AJHL and is the recipient of the Hobey Baker Award in 2019. Where was Cale Makar Born? Cale Makar was born on 30 October 1998. Her birth name is Cale Douglas Makar. She was born to a father, Gary Makar, and a mother, Laura Makar. Her birth place is in Calgary, Alberta in Canada. She holds Canadian nationality. He has a younger brother, Taylor Makar. He is of Ukrainian descent on his father's side. He first played within the Crowchild Blackhawks minor-hockey program. He moved to play with the NWCAA Bruins at the Bantam level in 2011. He played bantam with the Calgary Flames before moving to a minor midget with the NWCAA Stampeders. He was originally drafted at the major junior level by the Medicine Hat Tigers in the eighth round (No. 164) of the 2013 WHL Bantam Draft. He returned to the Calgary Flames for the minor midget level. He led the team in the 2014-15 season in scoring with 23 points in 34 league games. He was named the team's Most Valuable Player and Alberta Midget Hockey League First All-Star Team. He joined as an affiliate player to the Brooks Bandits of the Alberta Junior Hockey League to retain his NCAA eligibility. He agreed to return with the Bandits in the forthcoming seasons and also announced his commitment to play collegiate hockey with the University of Massachusetts-Amherst of the Hockey East. He established himself as a standout defenceman with the Bandits in 2015-16. He recorded 55 points in 54 games earning AJHL All-League and All-Rookie recognition. He helped the Bandits claim the AJHL championship. He also collected AJHL and CJHL Rookie of the Year Awards, the Western Canada Cup Top Defenceman Award, and the RBC Cup Top Defenceman, Top Scorer, and Most Valuable Player awards. He led all defensemen and finished sixth among all skaters in the AJHL with 75 points in the 2016-17 season. He also earned the league's most valuable player and top defenceman accolades. He helped Bandits to second straight AJHL championship and a second-place finish in the Royal Bank Cup. He was chosen as the RBC Cup Top Defenceman and Most Valuable Player. He was the first player to ever be named RBC Cup MVP in back-to-back seasons. He was the recipient of the CJHL Most Valuable Player Award and the prestigious RBC National Junior A Player of the Year Award. The Colorado Avalanche selected him with the 4th overall pick in the first round of 2017 NHL Entry draft. He was the highest drafted player to come straight from the AJHL, and just the second in the first-round since Joe Colborne in 2008. He opted to remain loyal to his commitment in joining the rebuilding UMass Minuteman program for the 2017-18 season. He collected his first collegiate point in his debut against Arizona State University in October 2017. He recorded his first goal in a 4-0 victory over Merrimack College in the same month. He finished fifth on the team in scoring, second amongst the blueline, with 5 goals and 16 assists for 21 points in 34 games. He was selected with co-Rookie of the Year honors by the New England Hockey Writers Association and by finishing ninth in defenseman scoring in the Hockey East. He was selected to the conference's All-Rookie and Third All-Star Teams. Colorado Avalanche showed interest in him turning pro. However, he opted to continue his development in returning for his sophomore season with UMass in 2018-19. He became the first Minutemen honored as the Hockey East Player of the Year after he led the league in scoring and finished second in the conference. He was also selected for the Hockey East First All-Star Team. He won the Hobey Baker Award in April 2019. He signed a three-year entry-level contract with the Colorado Avalanche on 14 April 2019. He scored his first career NHL goal with his first shot in the league in his debut game on 15 April during Game 3 of the first round of the 2019 Stanley Cup Playoffs against the Calgary Flames. He became the first defenseman to score a playoff goal in his NHL debut. Team Canada West selected him to compete at the World Junior A Challenge in 2015 and 2016. He helped Canada West to win gold in 2015. He was selected to the Tournament All-Star Team in both years. He appeared for Team Canada at the World Junior Summer Showcase in Plymouth, Michigan. He was selected to Team Canada's under-20 team for the 2018 World Junior Championships in Buffalo, New York, where helped his team to win gold. He finished the tournament leading all defenceman with 3 goals and 8 points in 7 games. He was also the only Canadian named to the All-Tournament Team. He reportedly turned down an invitation to join the senior team for the Olympics in Pyeongchang. He turned down the invite in order to focus on his season at UMass. Who is Cale Makar Dating? Cale Makar is unmarried and reportedly single. He is a young and aspiring hockey player focused on his professional hockey career. No rumors regarding his personal life have surfaced it. What are Cale Makar's Body Measurements? 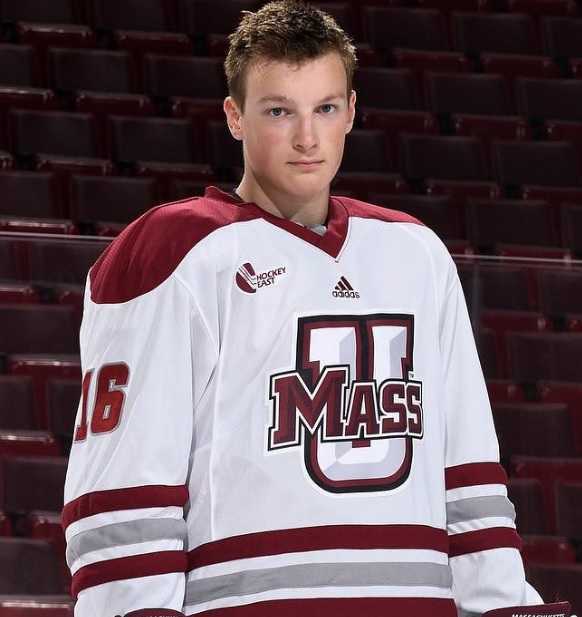 Cale Makar stands at a height of 1.85 m i.e. 6 feet and 1 inch tall. He has a body weight of 192 lbs i.e. 87 kg. He has an athletic body build. He has hazel eyes and his hair color is dark brown. What is Cale Makar's Net Worth? The winner of 2019 Hobey Baker Award, Cale Makar has just started his professional hockey career. The defenceman signed a three-year deal with the Colorado Avalanche on 14 April 2019. His major income comes from playing professional hockey. The young player has a long way to go in his career. As of 2019, his net worth is under evaluation. His brother Taylor plays at the junior level with the Brooks Bandits. His cousin Mark Logan plays collegiate hockey with R.I.T.